What does setting the Toughness Level do? As a top priority, the optimizer will make sure to reach your desired level of toughness before doing anything else. If it is able to pass your toughness threshold, then it will try to increase your DPS as long as it never drops below that threshold. We measure toughness via our TUF metric. If you set the toughness level to All TUF (sometimes labeled as All Defense, same thing), the optimizer will never consider DPS, it will only try to maximize your toughness. Similarly, if you set the toughness level to All DPS (sometimes labeled as All Offense, same thing), the optimizer will only consider DPS and ignore toughness. You will notice that we have some labels under the toughness level slider for LFR, Normal, Heroic, Mythic, and under those, similar labels for Mythic+ level. These suggestions are just that: suggestions! You may find that our suggested toughness threshold for doing Heroic raiding (or a Mythic+ 12 dungeon) is higher or lower than you prefer. Customize! Those labels are simply meant to give you a rough idea of where to put the slider, then tweak it up or down to your liking. If your current gear and the optimized gear is above the toughness threshold, we show score gains as a % DPS gain, because that’s what you care about now that you are tough enough. If your current gear or the optimized gear is not above the toughness threshold, we show score gains as a % increase to toughness. That’s the most important thing if you haven’t reached your threshold yet. In ranked lists of items (e.g. the Upgrade Finder), the same rules are generally used: items above the threshold are shown as % DPS change, items below are shown as % toughness change. We have done a lot of fancy math with the relative scores in the list to ensure that you don’t see any weird “jumps” in score as you just pass over the threshold — you always see a nice smooth change that meaningfully reflects the relative power of the items. We aren’t really “blending” TUF and DPS anymore, so showing a single stat analysis or graph doesn’t make a lot of sense. Instead, we have added UI to let you toggle between looking at TUF and DPS suggestions and graphs separately. We always default the toughness level to All TUF (All Defense). In BfA we have seen a lot more users interested in pure toughness optimization. We also think it is more intuitive for a tank optimizer to default to pure toughness — users will get the results they expect more often. Modify your toughness level to start mixing in DPS gear essentially becomes an “opt in” feature now. The toughness level slider only works with Mr. Robot’s gearing strategies; it can’t be used with your custom gearing strategies. For custom strategies, there is now a set of radio buttons that let you choose between all defense or all offense. The reason for this is that it takes a lot of extra data and analysis to make the toughness level feature work well. In order to enable it for custom strategies we would have to significantly increase the run time… and they already take quite a while to run. So for now we’re only enabling it on Mr. Robot’s strategies. If there is a lot of demand for it on custom strategies we will come back to it. But generally speaking, people are trying to do something very specific with a custom tank strategy, e.g. a custom boss script, and they are usually interested in all toughness for that custom scenario. You may have encountered some “weird” results from the optimizer with characters who have lower item levels. This update should significantly improve scoring for characters of any item level. It’s worth a short explanation of why it was a problem, and how we fixed it. We base all of our toughness gear rankings on tank simulations using the AMR tank simulator. There is a “sweet spot” when using the simulator to measure toughness — this isn’t just an “artifact” of the simulation model, it’s also a “real thing” in-game. Say you are really under-geared for a fight, e.g. ilvl300 gear and want to tank heroic Uldir. Things will not go well for you. Maybe some superhero healers could keep you alive… but then everyone else will probably start dying. The tank simulator is going to tell you this: you will die a lot. Now say you get one new item that brings you up to… ilvl301! Yeah! You know what the simulator (and all your healers and friends and the universe) will say to you now? Still gonna die a lot. It’s really hard to measure small toughness gains when you are getting crushed that hard. On the flip side, you run into the same issue if you are too tough. Small gains in toughness when you are already virtually indestructible are really small. You won’t be able to tell the difference in-game, and the simulator reflects this — your score will barely move if at all. So when we rank tank gear for toughness, we intentionally tune the simulator to make the fight challenging but not impossible. This is the “sweet spot” where you can really measure the impact of increasing your toughness — right as you are turning the corner on being able to reliably tank a fight. The “sweet spot” is not very large. If you go more than 30 item levels or so away from it, you get into the area where it’s hard to reliably measure the impact of toughness. To put that in perspective, data that we ran on ilvl370 heroic-ish gear will start to give wacky results if you are around ilvl345 or lower. That is why the old version of our site had a Normal and Heroic option for tanks — the Normal difficulty strategies could rank a bit better down to lower ilvls. Ultimately though, we (and users) got frustrated with how sensitive the tank optimizer could be. So we fixed it! We did two things: firstly we increased the amount of simulation data being used by almost 50%. Tank simulations are a lot more volatile than DPS simulations, so we just needed more data to reduce error. Secondly, we created a brand new statistical model for scoring gear based on that simulation data. This new model has much better predictive power at the extremes. 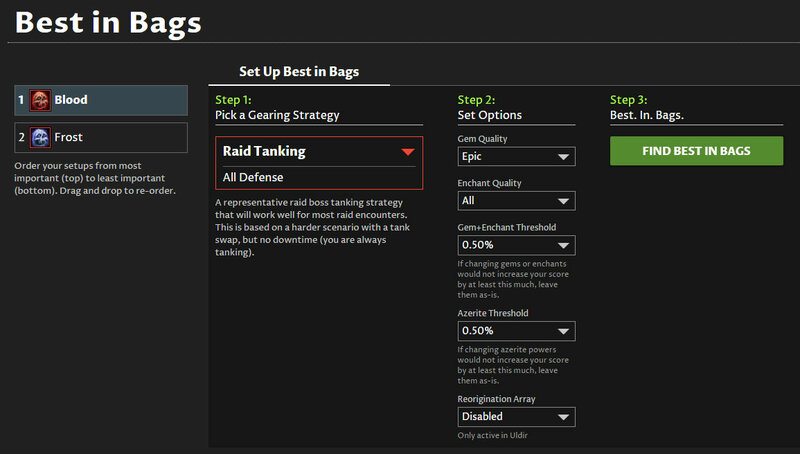 The new tank optimizer can give very high quality toughness rankings to around plus or minus 100 item levels of the “default” item level we use for all the simulations we do. That “default” level is 370 right now, so you should see really good rankings all the way down to ilvl270 and up to ilvl400 right now. If you are below ilvl270, gear rankings will be based purely on DPS. Worrying about toughness optimization at low item levels isn’t very useful. Just keep increasing your item level, and put on some DPS-oriented gear to make leveling and gearing up a bit faster. It was not very customizable. The available modes were too coarse, so it was hard to tweak it to just pick a few DPS items unless you got lucky. It would do a lot of technically “correct” things that people simply didn’t want. For example, someone who was definitely not tough enough would get recommended a purely DPS azerite trait or trinket that was a big DPS increase, instead of something that was a small or medium toughness increase. This is because the DPS increase was so big that it calculated the trade-off to be worth it. The new Toughness Level slider fixes both of these problems. It solves the customization problem by being much more granular — the first version has 22 unique levels you can set it to. And more importantly, the concept of a “toughness threshold” is a lot more intuitive than The Blender. We think that it maps more closely to how most tanks think about their gear.